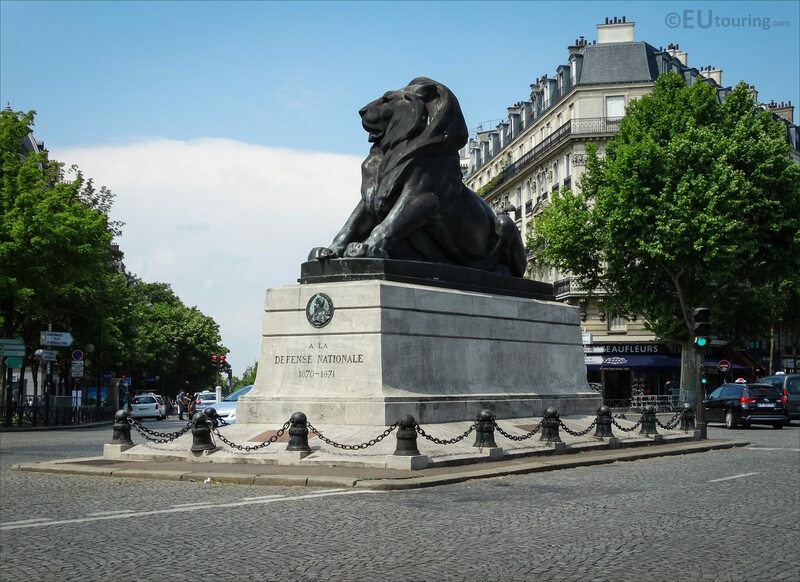 This time we were in the 14th Arrondissement of Paris at the Place Denfert-Rochereau, when we took these high definition photos showing the scale replica of the Lion of Belfort statue by Frederic-Auguste Bartholdi. 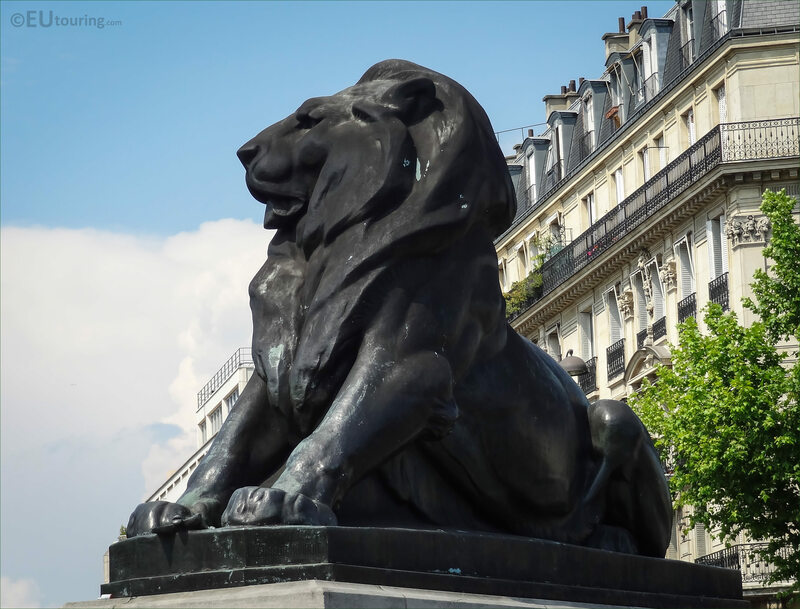 So this first HD photo shows the Lion of Belfort statue in Paris, which is a one third scale replica of the Lion of Belfort statue that was produced in sandstone by Bartholdi, and is located below the castle in the town of Belfort. 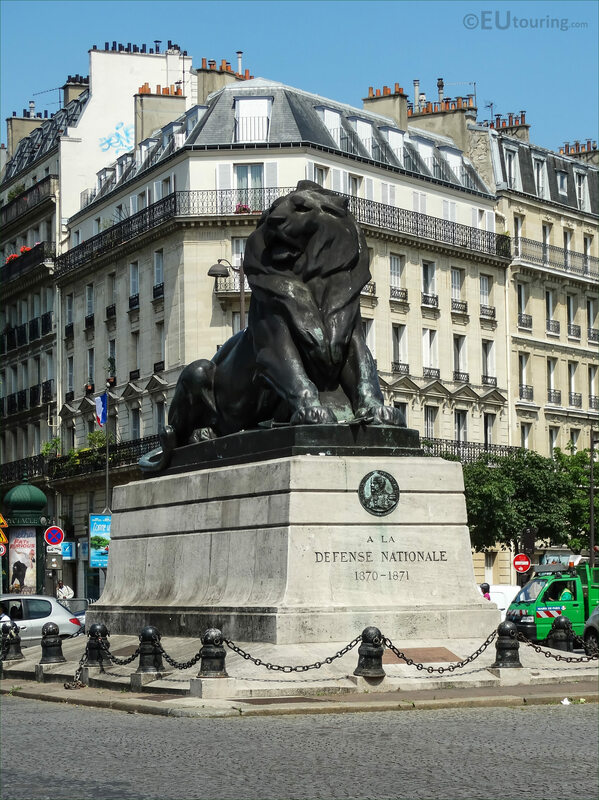 And originally, Frederic-Auguste Bartholdi, who is actually most famous for being the sculptor of the Statue of Liberty, presented the scale model of the Lion of Belfort in plaster at the 1878 Paris Salon, and this was subsequently purchased by the city of Paris for the sum of 20,000 French Francs. 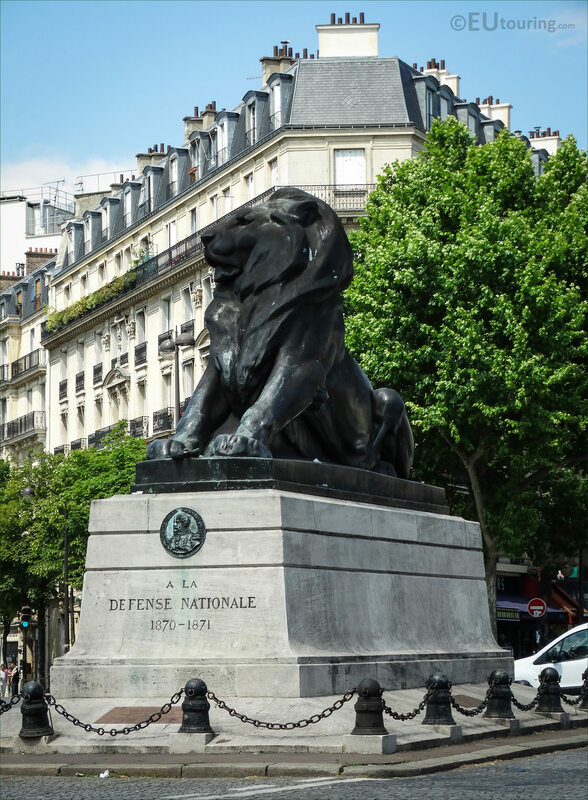 Now the original was actually designed as a tribute to Colonel Pierre Philippe Marie Aristide Denfert-Rochereau and the lion is a symbol of the heroic French resistance during the Siege of Belfort, which was a Prussian assault during the Franco-Prussian war in which France lost, but this area bordering between Germany and France still remained French, which in part was due to their courage and determination. 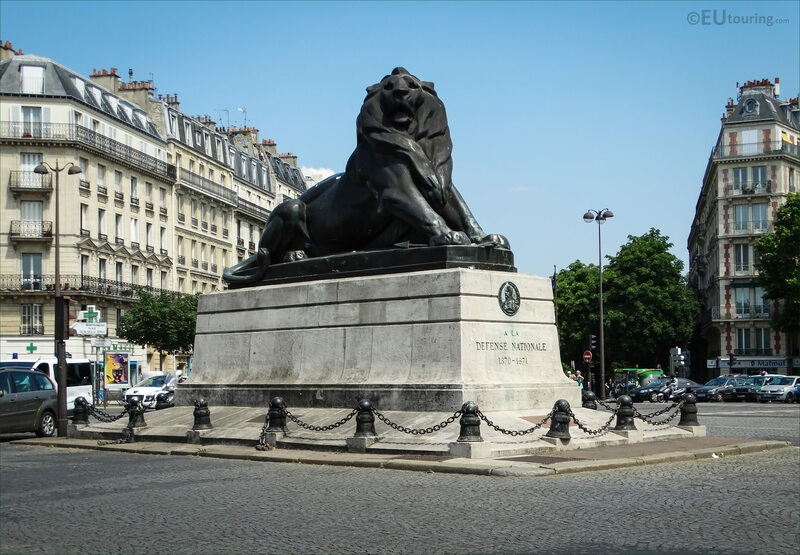 The cast was then made and installed at the Place Denfert-Rochereau in 1880, which was the year after this square in Paris had its name changed from the original one of Place d'Enfer, relating to the barriers from the Wall of the Farmers General. 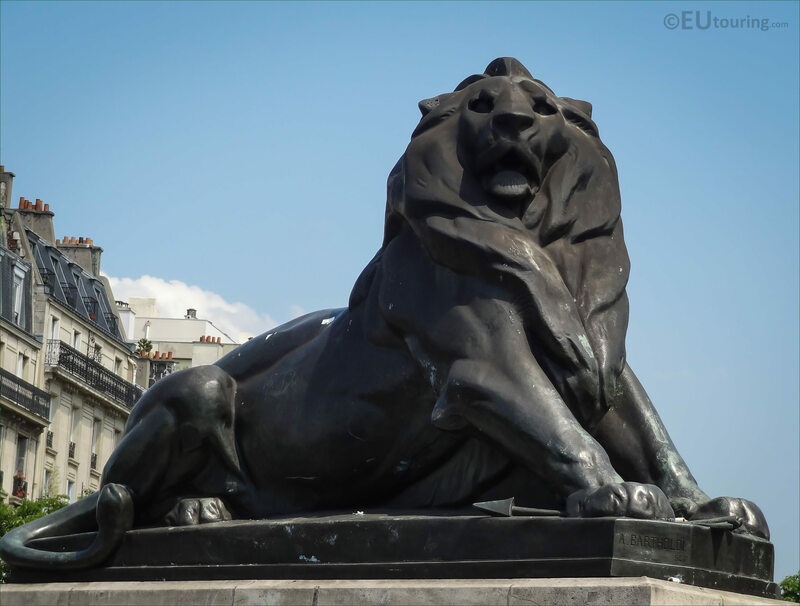 And although the monumental lion statue was only restored in 2001 and re-inaugurated on 14th October 2001, there are signs of wear already, but as you can tell from this image it still looks very imposing, even though this lion statue in Paris is only a third of the size of the original, measuring around 4 metres in height and approximately 7 metres in length. So, as we mentioned before, this is the work of Frederic Auguste Bartholdi, who was born on 2nd August 1834, and became a French sculptor, who is most famous for producing the Statue of Liberty Enlightening the World, which can be seen in New York Harbour, along with scale models replicas in different locations in Paris. Yet Bartholdi also fought within the Franco-Prussian War, and hence his interest in producing the Lion of Belfort statue, but numerous other works can be found in places such as Colmar where he was born, in the United States of America and other places throughout France, with his last statue being completed in 1903, prior to his death from tuberculosis in 1904. 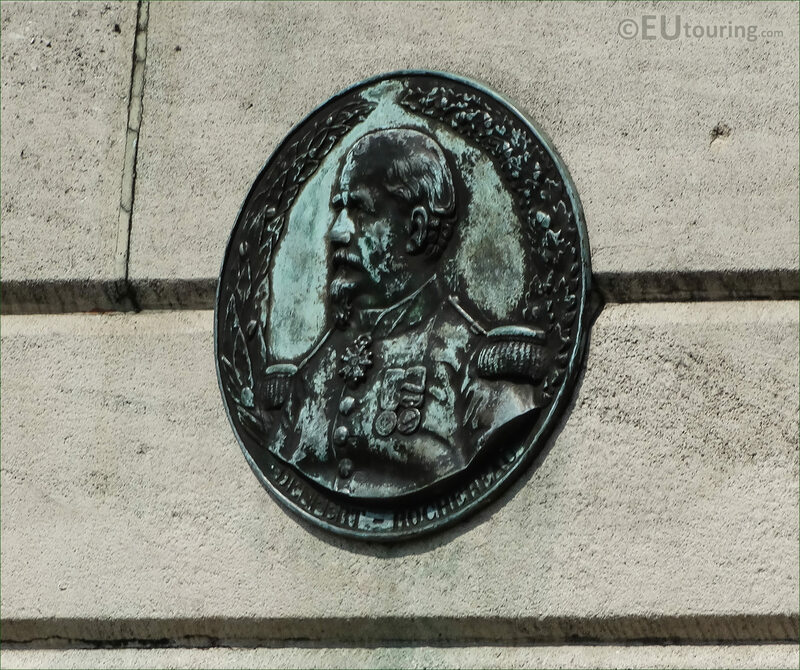 But In this HD photo you can see the medallion with a short caption below, which generally translates in English as; To the National Defense 1870 - 1871, and on the ground you will see there is a plaque, and this translates as follows.. 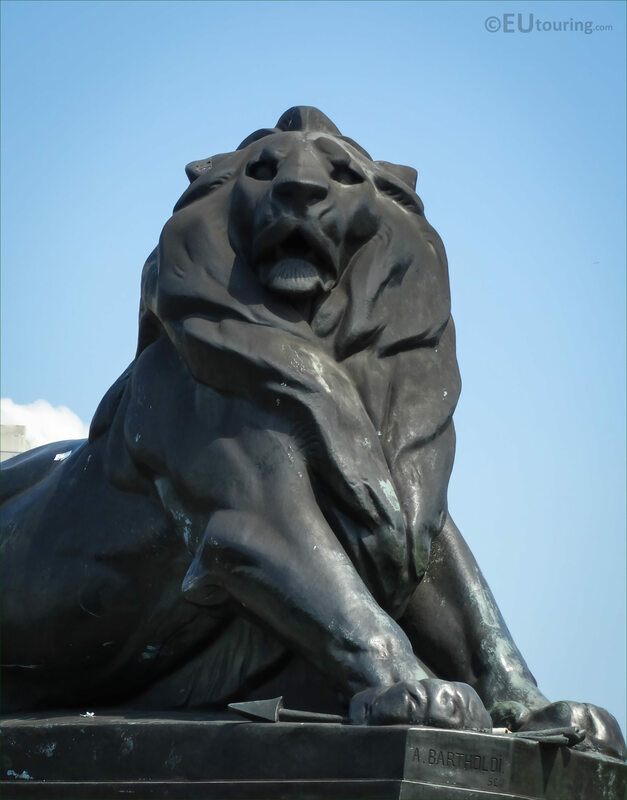 The Lion of Belfort is a statue of Frederic-Auguste Bartholdi. Replica of the work Belfort erected in honour of the defenders of the city during the siege of 1870 - 1871. The plaque was unveiled on October 14th 2001. Bertrand Delanoe, Mayor of Paris, Jean-Pierre Chevenement, Former Minister, Depute Mayor of Belfort, Pierre Castagnou, Mayor of 14th Arrondissement. 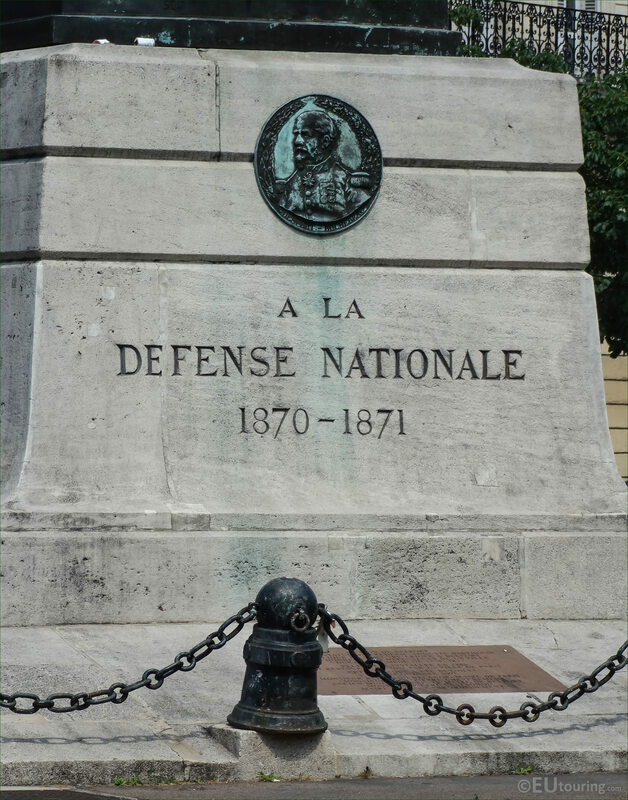 Now this close up photo shows the medallion that was put in place when the statue was restored by the city of Paris in 2001, and if you look closely at the bottom of this sculpture, you can see it states Denfert-Rochereau, which is dedicated to Colonel Pierre Philippe Marie Aristide Denfert-Rochereau, who was Governor of Belfort when Napoleon III declared war to Prussia. So, Pierre Philippe Marie Aristide Denfert-Rochereau, who was born in January 1823, became a military serviceman and politician, fighting in the Crimean War, and in 1860 he was sent to French Algeria, but shortly after his return to France he was appointed the commander of Belfort. And the Siege of Belfort lasted a total of 103 days, with over 15,000 people, yet there were only around 3,500 actual soldiers, and rest were all civilians who defended the fort from the attack of 40,000 Prussians, which is how come Colonel Denfert-Rochereau became so recognised and a national hero, saving the honour of France. 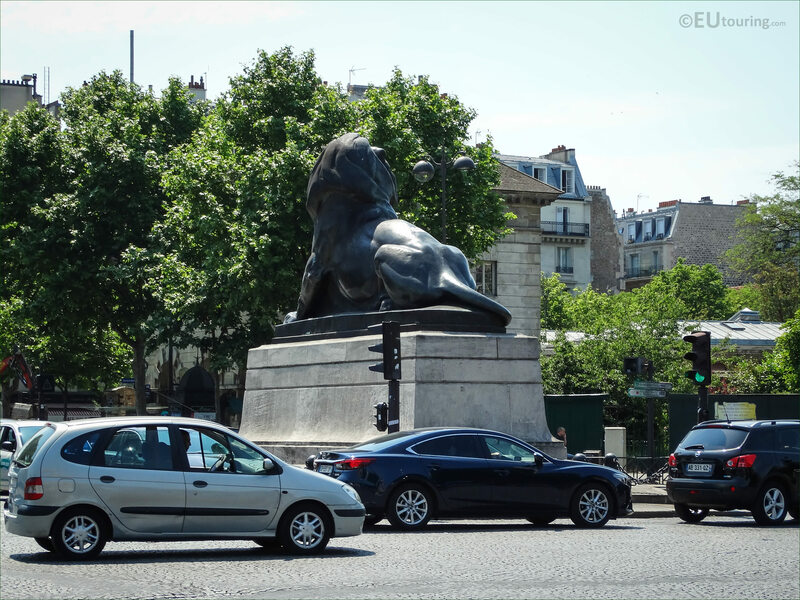 But as you could see from the high definition photograph above, the Lion of Belfort statue in Paris is located right in the middle of a major junction, or intersection, where several different roads converge. 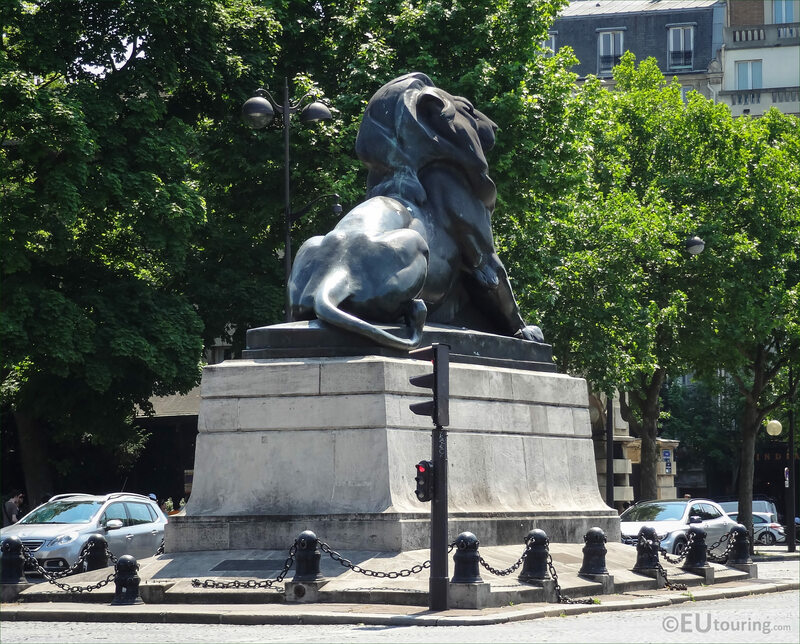 Yet this Monument to Denfert-Rochereau is positioned in a very historical area of Paris within the 14th Arrondissement, with several other tourist attractions here such as the Barrier d'Enfer buildings, the famous Paris Catacombs and three additional small gardens with statues, that you can also enjoy when visiting this area.